Compulsory voting has its roots in the Greek system of city-states where all males had a duty to vote on matters that affected the system. However, Belgium is known for having the oldest existing system of compulsory voting since 1893. Presently, there are 22 countries in the world where compulsory voting is mandatory. The idea of compulsory voting entails that all eligible citizens must register themselves as voters and cast their votes in the national elections aliter they will be penalized and fined for their omission. Voting ensures the involvement of the general public, which is an implication of a democratic system. Democracy, as described by Abraham Lincoln, means a government of the people, by the people and for the people. Compulsory voting in a democratic system has its merits and demerits and the commentary of several scholars in this regard is insightful. A state’s prosperity can be gauged by looking at the people’s involvement with the system, while compulsory voting ensures the participation of every eligible citizen. Arend Lijphart (1997) endorses the theory of compulsory voting as a tactic to increase voter turnout. He suggests that lower voter turnouts are perilous for democracies. Lower turnouts mean less public interest and incorrect representation of sentiments of the general public. In situations such as these, the state is procured by political leaders who are ill-equipped to handle the pressure. Consequently, the state takes a downhill slide from that point onward; decline in the economy, recession in the purchasing power of currency, increase in poverty, rise of inflation and lack of social security form the list of a very few issues that are followed by infirm leadership. The general public gets more disappointed and there is overall frustration looming far and wide over the state. The objective behind the Australian government’s enforcement of compulsory voting before 1925’s federal election was to address the issue of “voter turnout” which had shown a significant decline from over 71% in the 1919 elections to less than 60% in the 1922 elections. Since then, voter turnout has always been above 90% and remains such to date. What’s remarkable about compulsory voting is that the money spent on election campaigns decreases significantly. We know that candidates spend huge amounts of money on election campaigns with a primary focus on urging voters to cast their votes on election day. When the law of the country is such that all eligible people are under an absolute duty to vote, two things happen: the time and effort spent on inviting the voters to vote decreases and shifts towards the discussion of more important problems the county is facing. The supporters of compulsory voting often relay that it increases public interest in politics. People are keen to know what their options are and they acutely assess the politicians before they cast their votes. Where political literacy of the general public increases on one hand, the political legitimacy of politicians increases on the other. Politicians know that they cannot make frivolous and lofty promises before the elections just to turn their backs on people after they win. They are mindful of the fact that the masses that voted for them will depose them in mid-term elections if they fail to perform. The masses are well involved in the system and this knowledge enhances the performance of elected leaders. This attitude of the masses and the politicians stabilizes the political landscape of the country. The idea of compulsory voting faces many challenges as well: first being that there should be no compulsion in a democratic form of government. The casting of a vote is a civic duty of citizens, however, no one should be obligated by law to do it. Legal academics in the United States of America reiterate that it is a violation of ‘freedom of speech’ which ipso facto includes the freedom NOT to speak. It is a right given to them by the First Amendment to the United States Constitution and it will not be wrong to say that they hold their Constitution very close to their hearts. An indication of this is that despite lower voter turnouts in their elections – 58% of eligible voters went to the polls during the 2016 election, 62.3% in 2012, only 48% in 1996 – they are not willing to introduce compulsory voting in their country. Another criticism is that where compulsory voting pushes the citizens to educate themselves, it is quite possible that the voter who has honestly no interest may be forced to vote. On the contrary, the voters may be well-informed, but might have no partiality towards any of the candidates, or may have no desire to support the incumbent political system. In such situations, they might turn in a blank ballot, a skewed ballot or a ballot where they have randomly selected the candidate only because they are under an obligation. This disrupts the agenda of elections and increases the proportion of random votes. Jackie and Sun (2006) have propositioned that as long as the voters are not systematically biased, random votes will not have a drastic effect on the results. Moroever, the Supreme Court of Pakistan in Workers Party case (2012) also explored the option of being able to vote for “none-of-the-above” should voting be made compulsory. It is worthwhile to note that wherever this system is followed, it has been manifestly beneficial in increasing voter turnout and enhancing the interest of the masses in politics and in electing desirable leadership. Budding democracies – like Pakistan – can achieve political maturity with this form of voting. The success of democracy is contingent upon public interest in the system. Having said that, it can always be relinquished when need be. The Case for Compulsory Voting in the United States, 121 Harv. L. Rev. 591, 601–603 (2007). 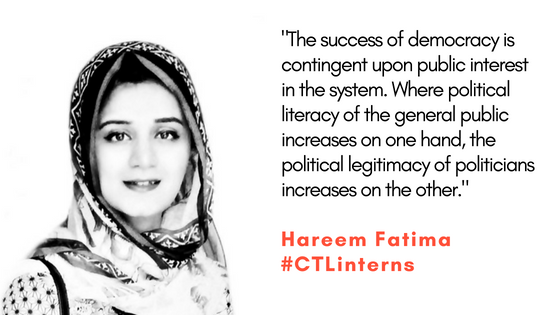 The writer is a final year law student of University of London's LLB program at Islamabad School of Law. She is a scholar under Courting The Law's National Law Scholars Program and an intern at Courting The Law.